↑ "Colin Meloy". Montana Kids. Montana Office of Tourism. Retrieved September 5, 2011. ↑ Monger, James Christopher. "Biography: Colin Meloy". Allmusic. Retrieved September 6, 2011. 1 2 Schweber, Nate, "The Making of Meloy", The Montanan, Winter, 2009. Retrieved 2011-04-08. ↑ "Jack White, Patti Smith, Colin Meloy, Conor Oberst, More to Play Inside Llewyn Davis Concert". Pitchfork Media. Retrieved February 18, 2015. ↑ "Biography". Carson Ellis. Retrieved 2013-11-02. ↑ "The Decemberists – Meloy Opens Up About Autistic Son". ↑ "Twitter / colinmeloy: Accord has been reached". Twitter.com. Retrieved 2013-11-02. ↑ "Bloomsbury Publishing: Let It Be". Bloomsbury Publishing: Let It Be. Retrieved July 26, 2013. ↑ "AJC Decatur Book Festival". AJC Decatur Book Festival. Retrieved June 21, 2011. 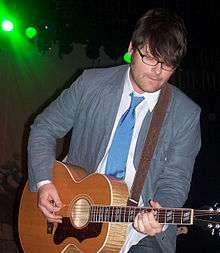 Wikimedia Commons has media related to Colin Meloy. "A Record Year for Rainfall"